The graphs below show the unemployment rate of citizens in the US with a further classification displaying average salary per week in 2005. The bar chart illustrates the proportion of the US population without a job by educational attainment, while the table gives the average salary paid to people according to the same criteria of education level in 2005. Salary earnings are listed in dollars per week. Overall, higher education levels seemed to correspond with lower unemployment rates. Similarly, people who spent longer studying tended to earn more money per week than those who spent less time at school. Of the total number of people unemployed, those with a degree and above were between three and four times more likely to have a job than those without in 2005. Americans without a high school diploma had the highest unemployment rate at just over 8%, while only between 1.5 to 3% of those with a Bachelor’s degree or higher were out of work. The salaries of people with professional or doctoral degree were the highest at $1740 and $1800 respectively, almost four times greater than those with the lowest level of schooling ($538) who furthermore earned the least. Units are given in dollars per week. Relate both graphs together with key trends. Here two clear trends are given, and the word “similarly” relates them. Key trend compares the highest and lowest values. Ensuing sentences fill in further details about those values and any other highlights. The key trend is that more educated people tend to earn four times more than those with little education. An adjectival clause is used to describe “those with the lowest level of schooling” to state that they also earned the least. This makes the sentence a complex sentence and removes the need to write another shorter one. Data can be given in parentheses (brackets) to reduce the number of words you need to state data. The bar chart illustrates proportion of US population without job with educational attainment, when the table gives the average salary paid to people according the same criteria of education level in 2005. Salary earnings listed in dollars per week. Overall, higher education level seemed to correspond lower unemployment rate. Similarly, people who spent longer studying tend to earn more money per week than those who spend less time at school. 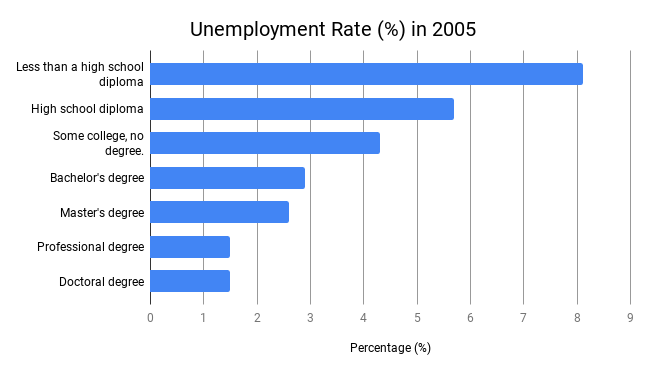 Of the total number of people unemploy, those with a degree and above were between three and four time more likely to have job than those without in 2005. American without a high school diploma had highest unemployment rate just over 8%, while only between 1.5 to 3% those with Bachelor’s degree or higher were out of work. The salary of people with professional or doctoral degree were highest at $1740 and $1800 respectively, almost four time greater than those with the lowest level of schooling ($538) who furthermore earn the least. Look at the bar chart first. Note the key trends of lower employment rate with higher education. Think of what grammar you can use to describe. Consider how to compare the highest and lowest figures for both unemployment. Think how to group data together in order to describe it. Look at table second. Consider the relationship between income and educational attainment. Look at the highest and lowest values, and decide how to compare them.